The Writers' Lens: A Shades of Fury Giveaway! Today on The Writers’ Lens we have a giveaway of epic proportions! A giveaway so great… it might even temper a fury! 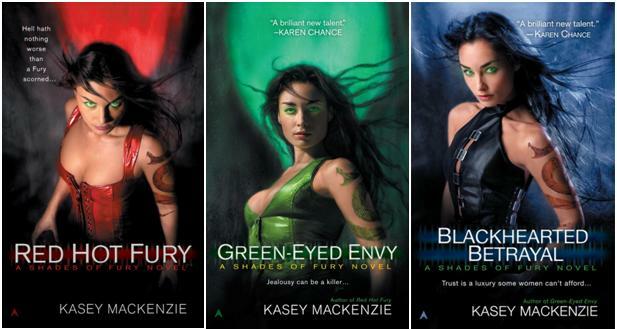 Because Kasey Mackenzie is an awesome author who loves her fans, The Writers’ Lens will not only be giving away a copy of Blackhearted Betrayal…but the entire Shades of Fury Series! That’s Red Hot Fury, the book that introduced the world to Riss Holloway, Green-Eyed Envy, the book that eternally hooked me as a Kasey Mackenzie fan, and the latest Riss adventure – Blackhearted Betrayal! Told you it was epic. To enter the Shades of Fury giveaway simply leave a comment or question on this post, the Kasey Mackenzie interview or any of the posts this week on The Writers' Lens. Please include your email so we can reach you if you win. The more comments you leave, the greater your chance of winning the contest. The winner will be chosen after midnight on Saturday, July 14, and the announcement made on Sunday, July 15, 2012. One note about the giveaway: Due to shipping limitations, you have to live within the continental United States to win. Apologies to the international readers, we also have giveaways that are fully online so anyone can win. One winner will receive a signed copy of each novel in the Shades of Fury series – Red Hot Fury, Green-Eyed Envy, and Blackhearted Betrayal! Thank you for entering, and good luck with the giveaway! Ahh, this is awesome. I was just admiring the new cover in Hastings, so this is fantastic timing. Thanks for the opportunity! Hi! I was just wondering who won this one, because I never saw it announced. I was super excited about this one. Just curious- thanks!